The Sally Port can be found on the surviving portion of the city walls known as West Walls. The area below this is now the public car park, accessed by turning left at the top of Botcher gate near the railway station. The area below the walls here, is called English Damside, and offers excellent views of the remaining portions of the West Walls, with the cathedral and the Prior’s tower visible in the centre portion. 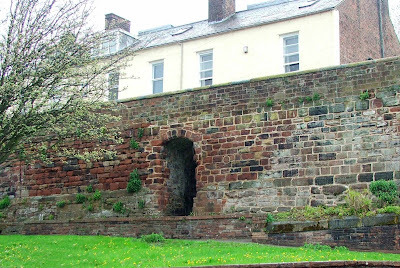 The walls are listed as grade 1, including the Sally Port and the Sally Port stairs, and date from the late 11th century, when William Rufus, brother of William I (the conqueror) ordered defences to be built around the city of Carlisle in 1092. The walls in this location are built against an ancient river terrace, and roughly follow the course of the original Roman walls. Some Roman masonry is also believed to have been used in the building of the Norman city walls. The Sally Port steps were added to the exterior of the walls in 1813, and were built to provide easy access from the base of the walls to the wall walk above. Unfortunately I’m not able to find a date for the building of this gate. The Sally Port is now no more than a blocked up, arched recess in the foot of the wall. A sally port is a small secure entrance\exit in a fortified wall. The idea behind this easily defensible doorway, is that it can be secured in the event of a siege, and defending troops can easily exit to harry the attackers.